Do it all with the Ninja® Intelli-Sense™ Kitchen System! The Ninja® Intelli-Sense™ Kitchen System is an absolutely amazing system that literally does it all. 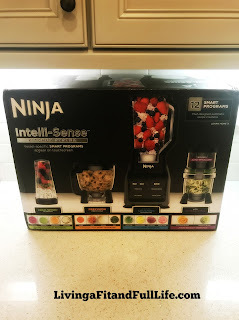 I love that the Ninja® Intelli-Sense™ Kitchen System is four high-performance appliances in one that enables me to clear up a ton of counter space in my kitchen. 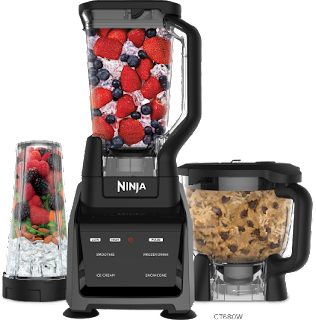 The Ninja® Intelli-Sense™ Kitchen System is a single-serve blender, full size blender, food processor and an auto-spiralizer in one amazing system. The Ninja Intelli-Sense Kitchen System has an intuitive touchscreen that automatically displays 12 different vessel-specific Smart Programs for smoothies, frozen drinks, thirst-quenching refreshers, salsas, dips, doughs, and more. It also comes with a recipe Inspiration Guide for even more ideas to whip up some easy recipes in the kitchen. Another terrific thing about this phenomenal system is that all the attachments are BPA free and dishwasher safe. As a mom of four I know how important it is to use BPA free products and love that the Ninja Intelli-Sense Kitchen System has the same standards. It's also extremely important that my kitchen appliances be easy to clean and dishwasher safe because I just don't have time to wash things by hand these days. The Ninja® Intelli-Sense™ Kitchen System is an extraordinary system that all kitchens need and with the holidays coming up, it would make a terrific gift!